As unlikely as it seems, the massive chunks of ice pictured here are not part of some elaborate Photoshop job. As Weintrob explains, a nearby lagoon filled with glaciers is the culprit behind this extraordinary natural phenomena. From time to time, pieces of ice break apart from the larger glaciers. They eventually float toward a small river, which feeds into the ocean. 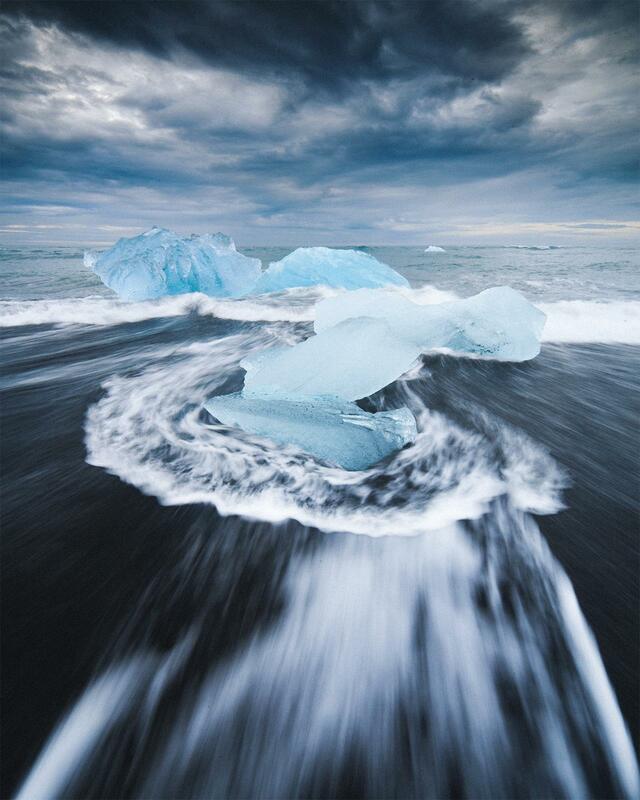 The waves then push the ice onto the shore, where they will eventually melt. Using a relatively long shutter speed (1/6 of a second), Weintrob managed to capture the motion of the water as it rushed past the block of ice, retreating back to the ocean until the next wave broke. Paired against an ominous grey sky, it’s hard to not feel a sense of awe gazing upon the powerful sea engulfing ancient bits of glacier. As tempting as it sounds to book a vacation to a sunny island, serious photographers should consider heading north instead. Some of the planet’s most remote corners hold the most outstanding treasures of all.